Bentley shows Diane the ropes. 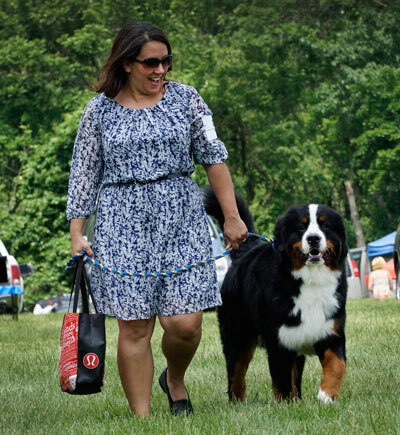 WRIGHTSTOWN, Pa. — The time drew near for Diane Pachella Nelson and Bentley, her 14-month old Bernese Mountain Dog, to enter the show ring. 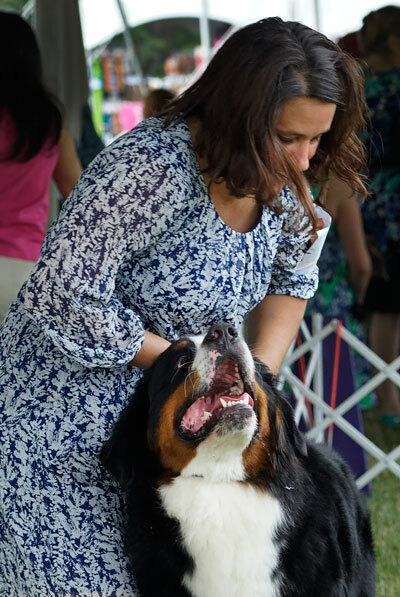 Bentley, Diane’s first show dog, was keeping cool under a ringside tent at the Burlington County Kennel Club dog show. He was the picture of calm … not his first rodeo. 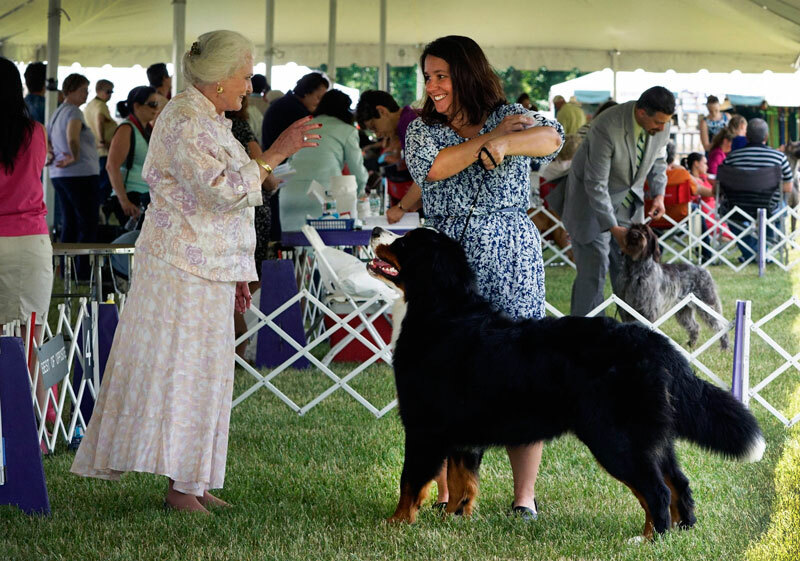 Guided by professional handlers in the past, Bentley had already been in the show ring a dozen times before this day. 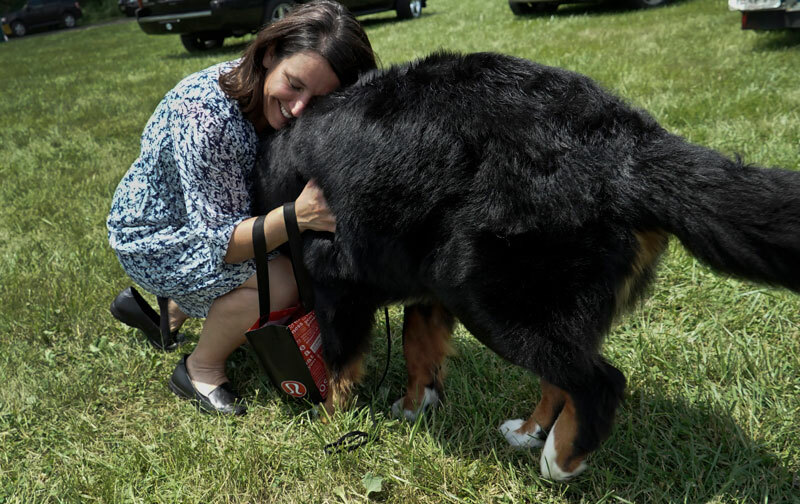 A professional handler was not available to show Bentley this day, so Diane had to show Bentley herself. It WAS her first rodeo. Grooming is important for both the handler and the show dog. Bentley merely needed a bath the day before. He’s a big guy. Diane describes his bathing experience in auto terms. “Like washing a Buick.” She jokes that it might be easier to just walk him through a car wash.
Diane tried to remember what everybody else wore in the ring. She decided on a flowing blue and white print dress, but realized at the last minute that she had no suitable shoes. That caused a last minute trip to a Payless Shoe store the night before the show, where she ran up and down the aisles trying shoes that might work in the ring. She needed to make sure she could move well in them. She settled on a pair of black flats … on sale for $12! In an attempt to break them in, she ran around her house in them. Diane had prepared for this moment by taking show handling classes where it’s perfectly OK to mess up and try again. Diane fixes her number – and her hot dog. As the clock ticked closer to ring time, she admitted to feeling some stress. “Here, you’re on your own. There are no do overs,” said Diane as she faced her newbie nerves head on. Comfortable in her own skin, she knew her first time in the ring might provide comic relief to those around her. Diane is pleased with her new cheapie shoes. With a good tread, the soles are perfect to prevent slipping on the grass. 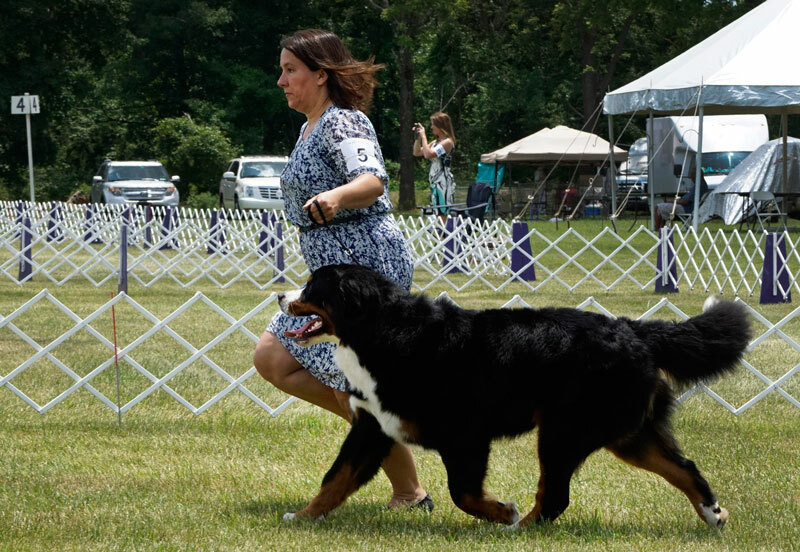 Only a few months ago, Diane hid behind a trash can at a dog show in Wildwood, NJ, trying to be invisible as professional handler Heather Bremmer trotted Bentley around the ring. But now “Mom” was handling. So Diane’s worries extended beyond falling down. She hoped Bentley wouldn’t completely ignore her by walking around the ring holding his own leash. “You know, they listen to you but it’s like teaching your own kid. They always listen better to a teacher that’s not Mom, and I’m Mom, so this ought to be interesting,” she said. Diane warmed up Bentley with a few passes outside the ring. Diane trots Bentley around the ring. 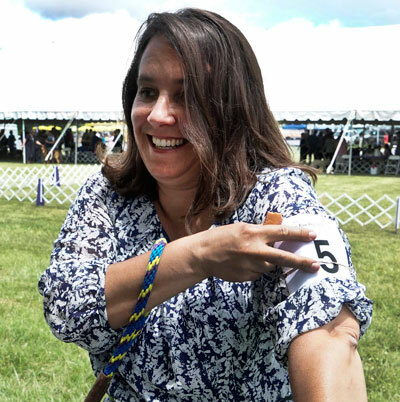 Diane secured the number 5 on her left arm with rubber bands. Bentley’s delicious bait, a greasy hot dog, was tucked under the rubber bands. They are off to ring 8, where judge Ruth Zimmerman was waiting. Bentley is in a class by himself … literally. He’s the only dog in the 12-18 month old class. Diane stacked him and showed his bite to Zimmerman, who examined Bentley by running her hands down his chest, along his back, down his hind legs, followed by the ever popular boy dog equipment check. The judge asked Diane to take Bentley down and back. That’s dog show lingo for moving away from the judge and coming back so the judge can see the rear and front movement of the dog. Diane moved briskly, perhaps a little too briskly. 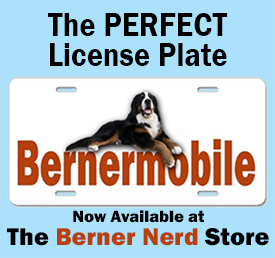 At first Bentley wasn’t moving well, but then he hit his stride. Bentley won his class and moved up to the best of breed judging. He was lined up two dogs behind none other than his own father, Grand Champion Blackrock Jungle Juice, aka Mufasa. Mufasa won Best of Breed at the 138th Westminster Kennel Club Dog Show in 2014. It was a small entry this day, so judging was done very quickly. Mufasa won best of breed and son Bentley won Best of Winners. Diane emerged from the ring with a big smile. “Well, we didn’t fall!” The positive experience gave her a lot of confidence and she now knows she could step in and handle Bentley in a pinch, but she won’t be quitting her day job anytime soon. The professional handlers’ jobs were safe for now. Nevertheless, Diane was thrilled that Bentley had earned another point towards his championship. The day was a success. The judge gives Diane some encouraging words. Diane’s preparation made for a successful day. “The most important thing I learned is that I practiced for it. I’ve practiced for it and I can do it.” It was a huge confidence builder to enter this show, she said. She knew they could do it. There were other small but important lessons, things you don’t necessarily learn in class, like managing the bait. Greasy hot dogs and paper numbers don’t mix. At one point, her number fell down to her elbow and the number slipped out with the hot dogs. 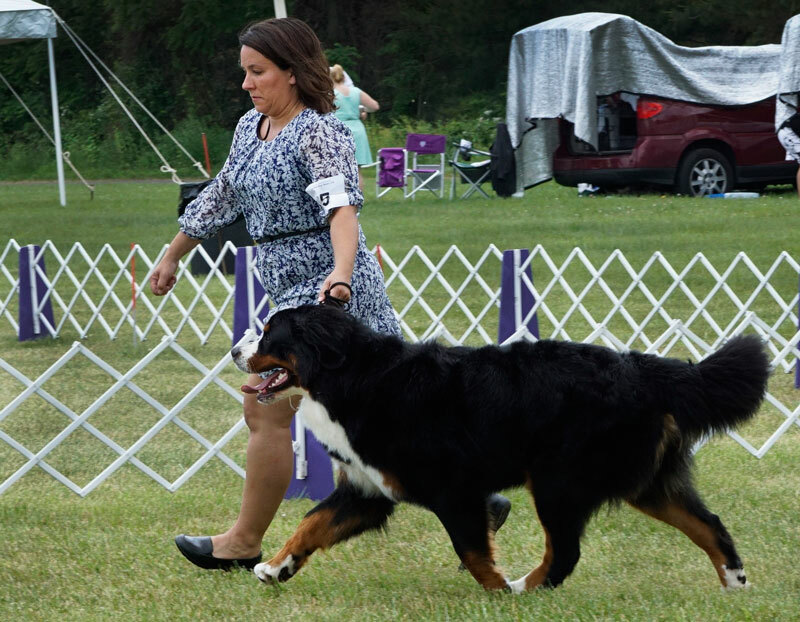 She was able to adjust while the judge was looking at other dogs. She vowed to switch bait the next time. Running around the ring with a hot dog hanging out of your mouth…not good. Oh yeah, another note for the future: cheapie shoes cause blisters. Bentley gets a big hug after the show. It was a great day. 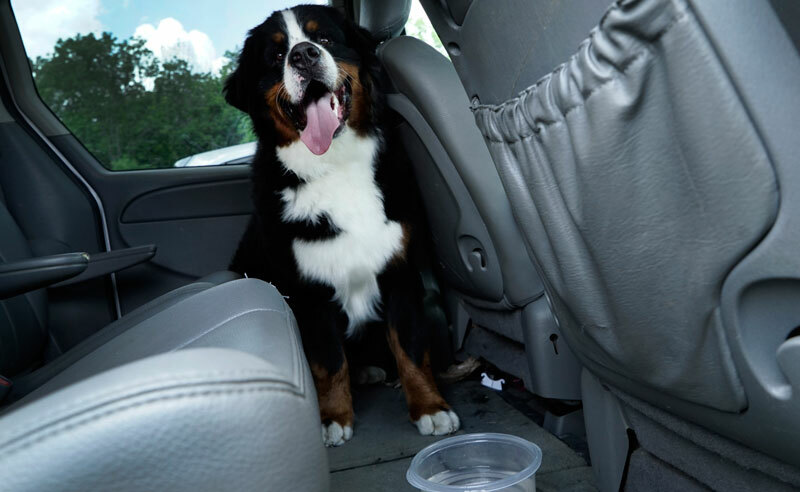 After giving Bentley a big bear hug, Diane walked to her car, turned up the air conditioning and poured Bentley a bowl of water. She planned a swim when she got home. Bentley cools off after his star performance. 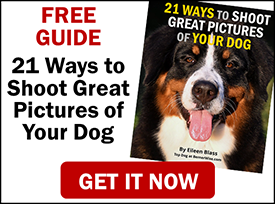 Another great article, Eileen I feel like I experienced this with Diane and Bentley. I am so proud of her and was thrilled to get her message that he had gotten another point! What a great team! A beautiful person and a handsome boy. Thank you, Eileen for this special article. What a lovely article Eileen. Just shows what we can do when we put our mind to it. A huge well done to Diane, she certainly looked as though she enjoyed it!!!!! Very good article. Fun read. I won’t be showing Rosie unless it is a rally trial. Bet I shouldn’t laugh when Rosie just looks at me like I am nuts during the trail. Have to remember it is serious business! That will be my down fall! My attention span is shorter than Rosie’s.